The Lusher High School community suffered a series of tragedies over the past week, the sudden death of a highly-respected college counselor and serious injuries to two student athletes, school officials said Saturday morning. Charles “Chaz” Prosser, the director of college counseling, rode his bicycle to school Thursday morning, started feeling unwell later in the day and took a cab home, said Lusher High School principal Wiley Ates at a Saturday morning meeting of the school’s governing board. He didn’t show up to work Friday, and school officials then learned that he had passed away, though they have not yet heard the cause, Ates said. Originally from the Baton Rouge area, Prosser came to Lusher six years ago after being selected following a national search, said school CEO Kathy Riedlinger. 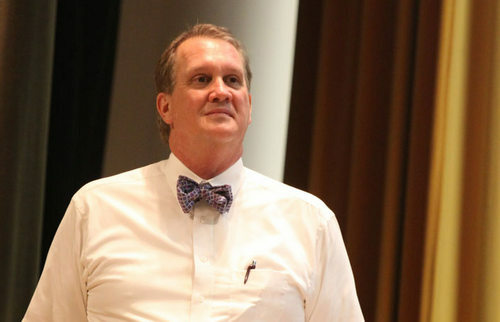 The news comes as Lusher seniors are just finding out what colleges they have been accepted to, and as usual, Prosser had successfully guided them to prestigious universities around the country, lending a bittersweet tone to those acceptances, Riedlinger said. Services will be Monday at Christ the King Catholic Church on the LSU campus, with visitation from 1 to 3 p.m. and a mass following. Riedlinger said she expects a large number of Lusher staff and student to attend. The blow of Prosser’s death follows two serious injuries to student athletes over the past week. In one incident, a Lusher baseball player was sliding into base during a game when he collided with a catcher and suffered a serious concussion, Riedlinger said. He’s expected to make a full recovery, but he may spend much of the remainder of the year at home. In the second incident, an eighth-grader participating in football conditioning exercises Thursday collapsed, Riedlinger said. He was taken to Children’s Hospital, where he remains in stable condition, responsive, breathing on his own and beginning to eat again, Riedlinger said. It’s unclear what caused his collapse, Ates said — the day was relatively cool, plenty of water was available, and the players were actually headed into a huddle when he collapsed. Riedlinger declined to name the students, citing their family’s privacy. The series of tragedies has left little time for the school to react, but Ates said he plans to institute an audit of the entire school athletic program “from top to bottom” for safety issues, nutrition and other best practices. He hasn’t decided on a structure for the review yet, he said, but may ask the Louisiana High School Athletic Association or Tulane University for assistance. “When something like this happens, we just have to go back and look at every detail,” Ates said. Facility search | The search for a new building continues without any success yet, Riedlinger said. The Jewish Community Center, where two kindergarten classes are now housed, is willing for Lusher to return, but school officials have not yet made a decision as they continue to look for a permanent home for the school’s added sections. “No one building has come available that would be big enough for the entire project,” Riedlinger said. If no building can be found Uptown in time, the agreement with JCC will be renewed, Riedlinger said. Renovations | Riedlinger has a meeting soon with the Kathleen Padian, new director of charter school for Orleans Parish, to discuss the pending renovations to both of Lusher’s buildings. In addition to sealing the exterior of the buildings, Riedlinger says she plans to discuss damage at the Fortier campus caused by an antiquated heating and air system. Meanwhile, school officials are also planning a series of security upgrades at Fortier, but that project is somehat on hold until they know the full scope of the renovation work. Crawfish | The school’s annual crawfish boil fundraiser will be held from 11 a.m. to 5 p.m. April 21 at the Fortier campus on Freret. The event has traditionally been held at the lower school on Willow Street, but had to be moved this year because that building is a polling place in the coming election, Riedlinger said. edit–Mr. Prosser was there for 5 years before he passed away.